A Beatles related bus, in Liverpool?! 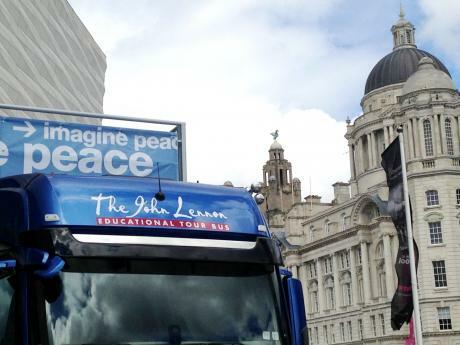 The John Lennon Educational Tour Bus has been launched in Liverpool, being driven (metaphorically) by Yoko Ono. Inspired by his dream in “Imagine” for of a world full of public transport, it’s a noble not-for-profit project aimed at getting people involved in more creative pursuits. The first one was implemented 16 years ago in America, where it travels coast to coast giving young people with a ticket to ride some Help! This magical mystery tour isn’t just for Day Trippers though- artists such as the Black Eyed Peas and Justin Timberlake rave about it. The YouTube channel for the bus describes the doors as “the most exciting part”- don’t let that put you off. They aren’t ordinary doors; they’re opaque, soundproof and segment the bus to leave you in peace to do whatever you need to to get that record deal. Yoko has a long record of philanthropy in the city – just last year she donated £100,000 to LJMU to help vulnerable students. The bus was kitted out by Sony with all the equipment required for music and video recording, including a green screen. Recently it was in Alder Hey hospital to visit children and save them from the coincidental visit from Kerry Katona. It will be going around the country, with a stop in London already scheduled. If you are getting on board, just make sure it’s not the 80A to John Lennon airport you’ve got on by mistake or you’ll be sorely disappointed by the chav on the back seats playing dubstep out of his mobile.